Stock market today, August 28, 2014: This morning, the U.S. Department of Commerce revised second-quarter GDP upward to 4.2% growth, while jobless claims slipped to 298,000 for last week. On Wednesday, stocks remained relatively unchanged, maintaining their record highs. On the international front, the German 10-year bund yield struck a record low yesterday, falling to 0.91%. 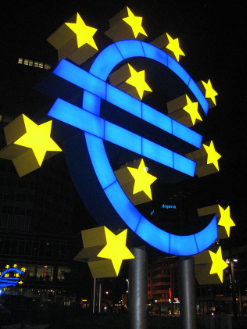 European equity and bond markets are quickly reacting to increased speculation that the European Central Bank (ECB) will begin its own massive round of quantitative easing. Last week, ECB President Mario Draghi said in a speech that the central bank could begin stimulus efforts very soon to help refuel struggling economies in Germany, Italy, and Spain, among others. Despite the optimism, many analysts remain divided on whether the ECB will act as soon as next week or wait until some point in the fall. Trouble Brewing: Geopolitical concerns are on the rise again this morning in Ukraine on news the Russian forces again entered the country. For the last two weeks, concerns on the region had abated. The stakes rose even higher yesterday after Ukrainian Prime Minister Arseny Yatseniuk accused Russia of threatening to cut off natural gas supplies to Europe this fall, in retaliation for financial sanctions on the country. Travel Abroad: In the midst of a widespread antitrust probe for the software company in China, Microsoft Corp. (Nasdaq: MSFT) Chief Executive Officer Satya Nadella has announced plans to visit the eastern nation in September. Although it is unclear whether Nadella plans to meet with Chinese officials over its possible anti-monopoly laws, such executive trips abroad tend to focus on strengthening political relationships, extending goodwill, and building new business opportunities. Discount Dealings: Shares of Dollar General Corp. (NYSE: DG) were off more than 1% this morning on news that the company reported lower-than-expected earnings in the second quarter and cut the higher end of its 2014 sales outlook. The company also reiterated this morning that it still planned to do everything to buy its rival Family Dollar Stores Inc. (NYSE: FDO), arguing that its buyout offer was more manageable and more lucrative than the bid offered by Dollar Tree Inc. (Nasdaq: DLTR). Hack Attack: The U.S. Federal Bureau of Investigation is currently conducting a widespread probe into reports that several major U.S. financial firms, including JPMorgan Chase & Co. (NYSE: JPM), were the victims of a widespread cyberattack, resulting in a significant data loss estimated in "gigabytes." An investigation is underway, although several sources, including USA Today, suggest that the FBI believes Russian hackers are responsible, perhaps in retaliation for Western sanctions against their home nation.